The Bromley's Venture is a fishing boat used by the local fisherman that reside in Conche Harbour in Newfoundland, Canada. Pack Ice encompasses Conche Harbour on the Great Northern Peninsula in Newfoundland, Canada which means that no commercial fishing boats can leave the harbour. 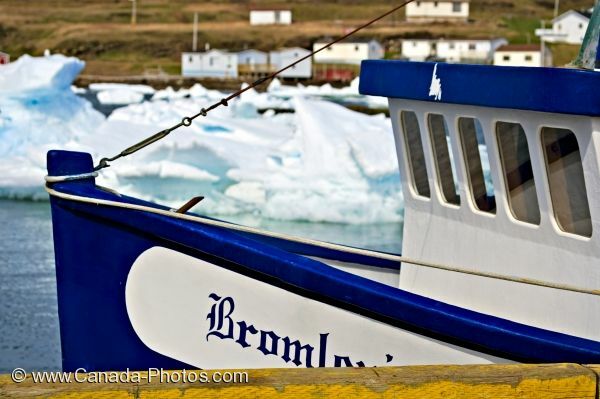 The Bromley's Venture is just one fishing boat tied to the dock waiting for the pack ice to eventually melt. Crab Fishing boat 'Bromley's Venture' in Conche Harbour unable to leave the dock because of pack ice, Conche, French Shore, Northern Peninsula, Great Northern Peninsula, Viking Trail, Newfoundland, Canada. Picture of a crab fishing boat grounded due to pack ice in Conche Harbour on the Great Northern Peninsula in Newfoundland.